Suite 300: 3rd Floor - Full Floor Office space available immediately, can be demised, Elevator access, bright with lots of windows. Suite 200: 2nd Floor - Full Floor Office space available immediately, can be demised, Elevator access, bright with lots of windows. Suite 100: 1st Floor - 2 retail units available for cafe, gallery, fitness, gallery studio, etc. 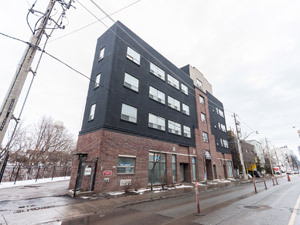 Suite 110: 1st Floor - 2 retail units available for cafe, gallery, fitness, gallery studio, etc. Elevator access. Concrete floors. Bright with lots of windows. One block south of Queen and Broadview. In Toronto's Film Studio District. Ideal for creative uses such as tech startups, film and design.